time for a small update to the equipment list. I now have a Breville smart grinder, to go with the Macap. A new espro tamp and some spanky new espresso glass cups and saucers. All I have is a Lelit PL041EM, a Behmor, a Super Jolly, a Pullman Tamper, 6 x 70mL ACF brown cups, 6 x 90mL Duralux Glasses, 6 x 160mL Duralux Glasses, 2 x ~170mL ACF Red Cups. Oh, and my new coffee bench that I had made up to match my kitchen. Ok, I have a problem too - Not bad seeing as this obsession is less than six months old. Nice Clock and Dirty tray ? What on earth are you on about ? Actually, in the old photo, that was my dog's Kong. I've since uploaded a new photo to replace it - it's probably cached the old one on your computer though. I've lived in this house for 18 months and no cockroaches. It's only a matter of time though . That one that says "Shut-up OR go on a starvation diet !!! " and "I mean it"
I guess that explains why Wotb is 'well-padded' then (and so are our cats) ! Machine: Vibiemme Domobar Super manual in stainless. 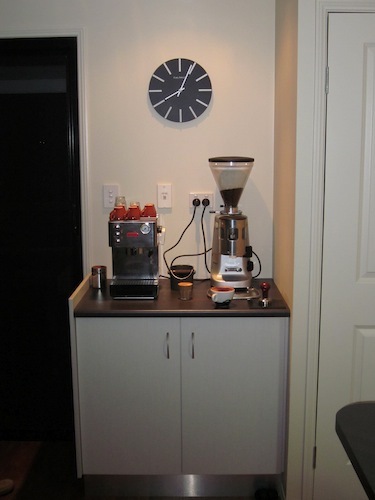 Roasters: Behmor 1600 X 2, Corretto with data logger, FZRR Baby Roaster which I never use and a popper. Home made bucket/extraction fan bean cooler. Pictures as well . It is a grand collection!! And of course jugs, cups, and other assorted stuff. Have recently made a "successful" concerted effort to dispose of a lot of the unused coffee paraphernalia I have accumulated over the past 40 years. Various tampers, cups & related stuff. Hi everyone I thought this would be an appropriate spot for my first post, I just migrated here from that other forum. 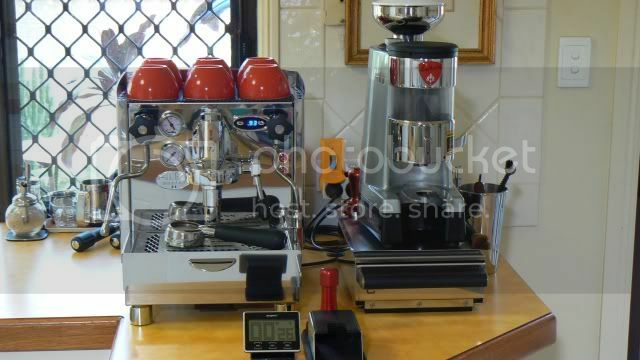 Shed: Rocket Giotto PP (immaculate condition), La Pavoni Europiccola (resto job), Bezerra BZ35 (resto job), Nemox Junior (immaculate condition), Eureka MDMCA (considering repainting for fun), Isomac Professionale, Nuova Simonelli Grinta (been trying to source new burrs for months now). Kind of scary now that I read back on what I've written. Hi John - welcome to Crema - hope you enjoy the environment... feel free to put any other personal info. [occupation, location or whatever] on the 'I'm new here' thread in Have your say; once again welcome to the forum. Thanks AM great to 'see' you again. This is Caffeine Junky from the other site. I saw your other thread regarding the RR45, sorry I can't help. ahhh gear. toys. there's never enough is there? 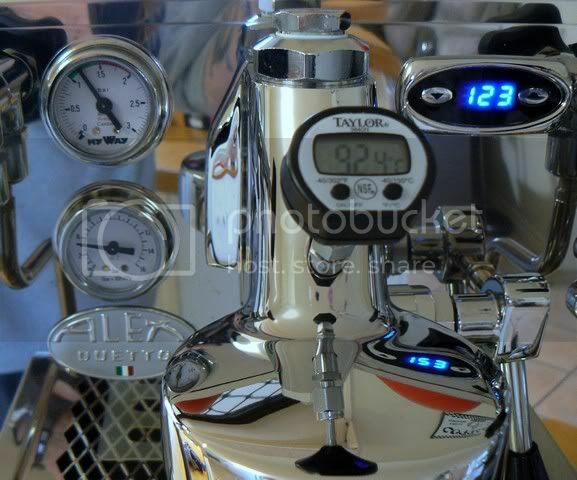 Grinder: Mazzer Robur-e & my Vario for decaf duties. 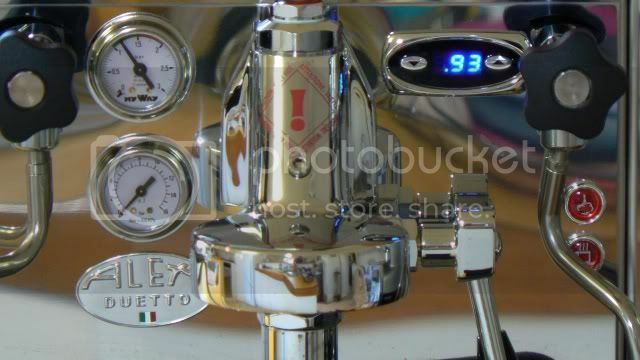 I have just replaced my Expobar Minore III so here is a update on my equipment. What happened to the retired unit ? Sitting in the front room at the moment till I move her on to a new home..
backup: second-hand Giotto [not the 'Premium', the earlier model]. Tampers too numerous to mention! Nemox Lux grinder and plunger fo work. Pyrex glass percolator or Stove Top for giggles. I am very happy with my setup and not looking to upgrade however if someone donated me a GS3 and a Nina I would always find room.